Google has been testing autonomous self-driving cars since 2009, driving over 700,000 miles in modified vehicles with no accidents or injuries. 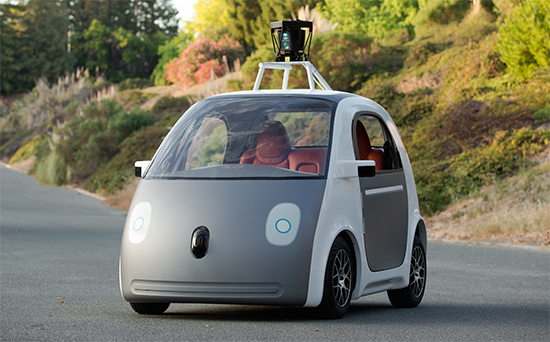 Now, Google has unveiled its plans to take this project to the next step with their new prototype autonomous vehicle! Unlike the last two Google self-driving cars, which were modified from existing vehicles like the Totoya Prius and Lexus RX350h, the new Google car has been designed from the ground up to drive itself! Because of this, it has removed many items and equipment from the car that was necessary for human-input driving, like the steering wheel and pedals. This first prototype vehicle is designed with safety in mind, taking advantage of foam-like plastics and windshield in order to minimize damage in the event of a crash. The car also only has a range of 100 miles, and can only reach speeds of 25 mph, but both of these limitations were designed with the purpose of safety, as well as to test out the autonomous driving functions. 100 of these new cars will be tested in California this summer, and will be taken to public roads across the nation by the end of the year. While Google says that fully autonomous cars are at least five years away from being ready for commercial use and retail, this new prototype vehicle is a big step towards making this sci-fi dream a reality.